Good ridance to “Rapid Transit”. I never liked the terminology anyway. However, on a more serious note, I hope the government will for once undertake a genuine consultation process, particularly for the extension beyond the CBD. 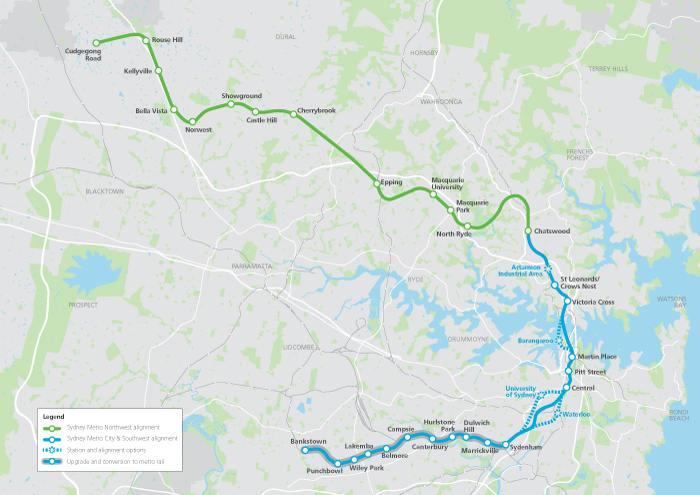 The conversion of the Airport Line to Metro and its extension to Revesby, or at a stretch to Glenfield, as an alternative to the Bankstown Line conversation should be given serious consideration. On the North Shore, it is essential that both St Leonards and Crows Nest should be included on the metro line extension. I can’t see any place for a station in the Artarmon Industrial Area, as it is largely car based. A station in Central Barangaroo is also essential. > I hope the government will for once undertake a genuine consultation process, particularly for the extension beyond the CBD. Won’t happen. Because if they did, they’d build the crossing in heavy rail :-). Ray, while I agree the airport stations should get metro-style trains, the Bankstown Line catchment is denser than the Revesby stretch. It also provides a possible extension from Bankstown to Liverpool via Bankstown Airport along the proposed enterprise corridor. This would support more growth in Canterbury-Bankstown and Liverpool areas. Waterloo station is not quite near Green Square station but I hope the government links Sydney Metro at Green Square rather than Waterloo to cater for the massive growth there and provide an interchange that is outside of Sydney CBD, minimising CBD platform congestion. I don’t think the higher density Marrickville-Bankstown vs Turrella-Revesby compensates for what should be very busy stations at the airport and also the quite high and rising density around Green Square and employment destinations near Mascot. Sorry to make an OT comment, but I’ve heard back from the government that a reason the via Eastwood alignment has not been proceeded with for the Parramatta Light Rail is difficulty getting through Brush Farm. This is a load of codswallop isn’t it Ray? Metro1 is not the end of the story; it will clear up paths across the harbour bridge [existing EC trains, plus the fact that most people from north of Chatswood will switch to the metro at Chatswood for a faster and more reliable ride] for the Macarthur and SWRL lines – allowing a much denser and metro-like service (or even full conversion) on the Revesby-Airport-CBD(-inner west) line(s). The Harbour Bridge’s paths are not meaningfully restricted. Neither are East Hills’ for that matter. Simon, the government’s reasoning behind ignoring the Parramatta Light Rail route via Eastwood because of the alleged difficulty of crossing Brush Farm Park certainly is a lot of codswallop. A high level arch bridge has been proposed in the past for the Eastwood County Road extension, which would create minimal disturbance to the park itself, although some trees, which have grown in recent years would have to be removed. If true, this is a matter of a vociferous local minority group who don’t want any redevelopment in Eastwood at all, including a light rail line. Ryde Council cancelled a review of the Town Centre Master Plan, largely because of the influence of this group. I find it difficult to understand how the government could ignore what is the most logical route for the light rail line via Eastwood in favour of the route via Carlingford and Epping, with all the challenges that are involved in that choice. What a strange claim. You must have missed all the years of wrangling over the shortage of parking in that area, it’s poor access by public transport, the introduction of parking meters, and the construction of larger and larger buildings. This looks like another odd assertion. If I was commuting 45 minutes to the CBD from Hornsby or Waitara or Turramurra, and I had a seat and a book or newspaper or smart phone or tablet, would I change to the metro to straphang in the noisy tunnel, to save 3 minutes ? Probably…. not. Whatever time you saved on the actual trip would probably be spent waiting on Chatswood station for the metro to arrive, anyway. Some people might, particular if the actual metro stop was actually closer to their precise destination. On the other hand, it might be further away. People do have a real reluctance to change, but it is not infinite. They also have a reluctance to spend longer on the vehicle or wait longer. Or sit in traffic. These can outweigh the former. It also depends on how easy the change is. In other cities people will actively choose the easier change once they learn it, if there is a choice. * A 3 person seat is actaully 2 plus a dedicated handbag seat. * All trains must go to the CBD, forget about actually building network connections between lines like other countries. * All trains must always operate to a timetable, a system like a train every 3mins is far too difficult to implement. * Rather than use standard transport symbols, lets waste millions and use T, B, L and F that even baffles english speaking Australians. Sydney Metro is a waste of money we already have an excellent rail network in known as Sydney Trains.IIt’s just a plot by developers & Baird regime to destroy Sydney Trains,, then they will sell off Sydney Metro to their evil mates.